This is from the famous Russian collection from the Fall/Winter of 1976-1977 and these are rare and hard to find. The now legendary 'Russian Ballet and Opera' or 'Opéra Les Ballets Russes' Haute Couture collection by Yves Saint Laurent for Fall/Winter 1976/1977 was one that took the fashion world by storm and has been endlessly re-interpreted since. 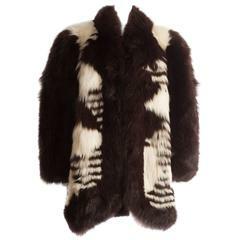 Here we have a leather and fur coat from the Yves Saint Laurent Fourreres line and it combines the practical with all the style and chicness that the Russian collection inspired. 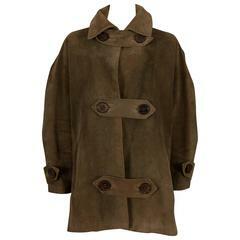 These leather and fur versions are rather rare and this particular coat is in exceptional condition. 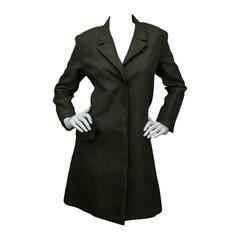 The leather is a soft lamb and the edges and dull upper inside bodice lined in a deep chocolate fur that is very soft and fine. I love how all the edges are top stitched with a deep red thread, placed to emphasize the lines of the coat and give it that Russian Cossack feel. 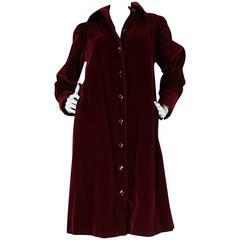 Highly polished buttons close the coat down the front and the skirt is amazingly constructed with lots of fullness. It really transforms when on a real girl and is just wonderful. Amazing and rare piece of fashion history. In excellent, museum quality condition. The upper bodice and cuffs are lined in fur and the sleeves and skirting of the coat are quilt lined. It closes with the buttons at the front. Tagged a vintage YSL 44. It has been specialty cleaned. Sleeves: 24.5" Shoulders: 16.5" Bust: 20.5" flat across from side seam to side seam Waist: 18.5" flat across from side seam to side seam Hips: 25-26" flat across from side seam to side seam Bodice: 19.5" from neck to waist Skirt: 29" from waist to hem Modern Sizing Equivalent: MED-LRG Send us a note to see these Reference Photos: (1) The Peasant Collection 1976 as photographed by American Vogue / (2) Coat from the MET / (3) Catherine Baba at the S/S 2017 Haute Couture Shows in Paris. (Top Photo by Nabile Quenum; Bottom Photo by Phil Oh) I have a small collection of historically important, designer labelled vintage furs and fur trimmed pieces stored away in my archives that I will be slowly posting over the course of this year and next. 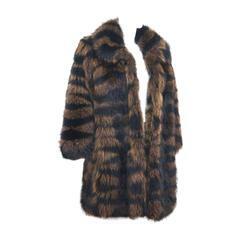 I will no longer be buying furs for the shop moving forward. I feel like times have changed and while there still is a place for vintage furs for some, including collectors and historians, many modern girls are choosing other options. Many of the pieces in my collection are representative of the designer during a set time period in history that was different then our modern outlook. I have decided that the best course to handle this controversial issue is to let the pieces I have go and refrain from any further buys from here on in. This garment has been professionally cleaned, pressed and is odor free. Thoroughly checked over before shipping, it will be ready to wear upon arrival. Please expand description above for full measurements.